The Bruins are in the quarterfinals for the first time since 2008 with the win over the Olympians. 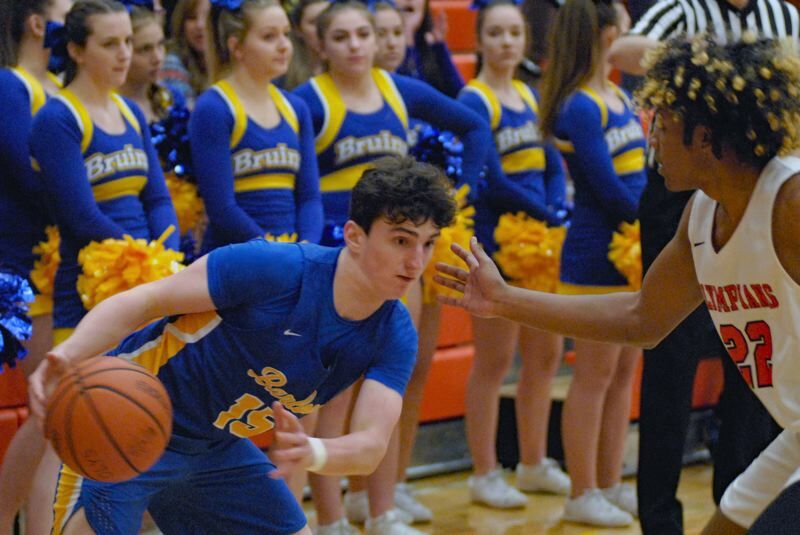 SALEM — The Barlow Bruins walked onto the gym floor at Sprague High School Saturday afternoon knowing that they were underdogs. But when the game started, the Bruins played like anything but underdogs. Barlow led from start to finish as the 20th ranked Bruins stunned fourth-ranked Sprague on their home court, beating the Olympians 84-62 and advancing to the state tournament at the Chiles Center. This is Barlow's first trip to the quarterfinals since 2008. For the second straight game, Barlow had four guys in double-figures. Daello Portin-Chapman led the Bruins with 24 points — 16 of which came in the fourth quarter. Jesse White finished with 17 points, Evan Inglesby had 12 points and Dominic Jacoby chipped in with 11 points. "Our depth has been one of the biggest keys for us all year," Barlow head coach Tom Johnson said. "There are seven guys on this team that I could start at anytime. I'm obviously really pleased with how we played today…I'm just so happy for our kids. I've seen how much time they have put in the offseason working." Sprague was called for a technical foul in pregame warmups for dunking, sending White to the line for two free throws before the game even started. Once action got going, the Bruins sent a message to Sprague immediately. After converting one of his two free throws, White followed with a mid-range jumper and then found Inglesby for an easy layup on Barlow's next possession. Moments later, after a steal by Cole Edmondson, White launched a deep 3-pointer that hit nothing but the bottom of the net. Just over a minute into the game, Barlow was already up 8-0. A straightaway triple from Austin Forrar gave the Bruins a 10-point lead at 15-5. However, Barlow started to face some adversity later on in the quarter. Both Jacoby and White were called for two fouls in the period and were forced to go to the bench. Sprague took advantage by going on an 11-2 run to cut the lead to one, but a 3-pointer by Portin-Chapman stopped the bleeding and put the Bruins on top 20-16. It felt like the momentum was changing in Sprague's direction when White picked up his third foul with 5:17 left in the second quarter with the Olympians trailing by just one at 23-22. But with their point guard on the bench, the Bruins rallied in a big way. Jacoby scored seven of the next nine Barlow points to give the Bruins a 32-24 advantage. On their next offensive trip, Edmondson sliced a pass between two defenders to find Inglesby for the open layup as the Bruins completed an 11-2 run of their own to get their lead back up to 10.
look for extended coverage in the March 6 print edition.